Alienware machines are getting more and more Dell-like. 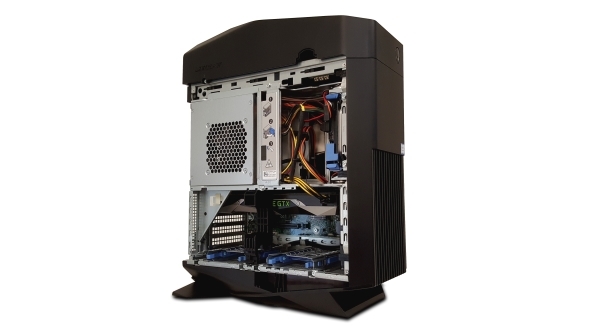 Where once an Alienware desktop rig meant an expensive, vaguely Giger-esque design, with sweeping curves and vented cheeks, since Dell took over they’ve slowly started looking more and more like the sleepy corporate boxes liberally spread around offices across the world. But with a couple more LEDs. Obvs. When all (GPU) things are equal your choice of processor makes a big difference. Check out our pick of the best CPUs for gaming right now. The $1,500 (£1,394) Aurora has taken some of its design cues from the Area 51 – its more attractive, invited-to-all-the-parties, prism-shaped older sibling – but Alienware have beaten the Aurora with the Dell stick and molded it into a rather more of a grey corporate aesthetic. But looks aren’t everything. If a beige box could give me 60fps at 4K I’d forgive its early 90’s facade. 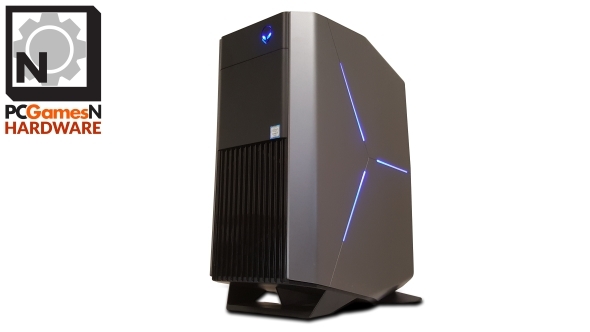 So what can the Alienware Aurora offer? Jab a virtual pointing device at the jump links below to skip to the different sections. Intel’s Kaby Lake is very much on its way very soon, but the Alienware Aurora’s Skylake Core i7 is still a mighty capable gaming processor. 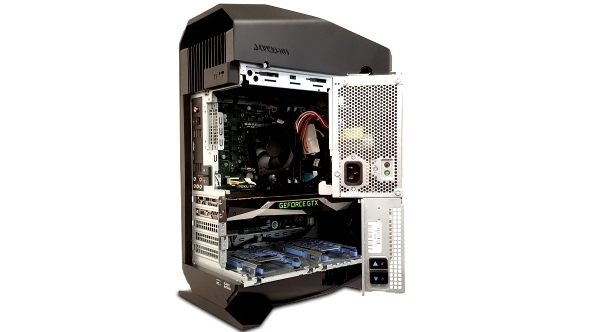 They’ve gone for the stock-clocked Core i7 6700 version instead of the overclockable K-series chip, but that makes more sense in this bespoke zero-fat chassis design. Cooling would be an issue in a case this small, so keeping to the base 4GHz Intel Turbo clockspeed is a far safer option. The chip’s been dropped into a specially designed Z170 motherboard, specced to fit inside the Aurora’s cramped insides and most definitely not for looking at through a Perspex peep hole. Its old-school, retro green PCB plays into that Dell corporate aesthetic, even if it is rocking gaming-grade components. And the GTX 1070 is most definitely that. The straight Founders Edition card – AKA completely normal reference card – has the standard clockspeed and basic Nvidia blower cooler, but still delivers excellent gaming performance. Being paired up with a quality, quad-core/eight-thread CPU means both can be pushed to their limits by the right game engines. The 256GB Toshiba NVMe SSD may not quite have the same level of performance you can get from the awesome Samsung 960 EVO drives but it still manages to give you a decently capacious boot drive that runs at serious PCIe speeds. Acknowledging that 256GB is the bare minimum for boot drive storage Alienware are also offering a 1TB of stone tablet hard drive storage. Considering we’ve put the Aurora up against a pair of PCs which cost way more than this Alienware gaming machine it’s performance is rather impressive. The diminutive £2,000MSI Aegis X comes with a GTX 1080 GPU, which means it has quite a frame rate lead, while the £3,000Cyberpower HL 700 comes with a GTX 1070. The Aurora still falls short of the HL 700, despite using the same kind of graphics card, because of the massive difference in processor power. 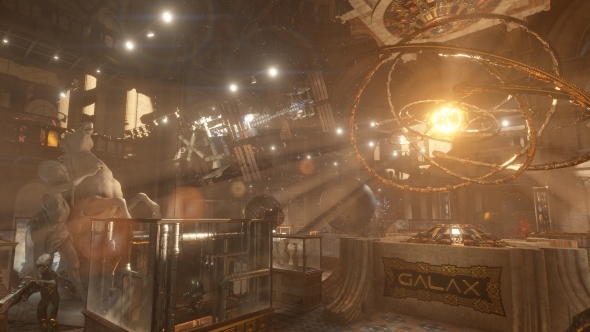 The GPU does have the biggest impact on gaming frame rates, but the CPU comes into play when things are otherwise equal. The HL 700 comes with the six-core / 12-thread Core i7 6800K, and also contains both CPU and GPU inside a full water-cooling loop. That means both are pretty heavily overclocked and that’s what gives it the edge in the performance stakes, but is also a big factor in why the Cyberpower machine is twice the price. Considering just how much more expensive the competition is the Aurora actually makes a pretty damned good case for itself. The biggest impact comes when running the rig at 1080p, at that level it’s around 11-13% slower than the Cyberpower PC, but the margins rapidly close when you push the resolution up to 1440p. That’s where we become far more reliant on GPU power and these two machines are a lot closer on that front which makes the difference in price hard to countenance. The CPU benchmarks show the disparity between the Cyberpower’s beefy six-core CPU and the overclocked i7 6700K of the MSI. The non K-series i7 in the Alienware Aurora is definitely behind in straight CPU performance, but it’s the right compromise to make when you’re going for a more price-conscious, dedicated gaming PC rather than aiming to create an almighty all-round superstar of a rig. Honestly, I was a little prejudiced. I foolishly assumed the Alienware Aurora would be rather overpriced for the components inside it, but I have to admit to being mighty impressed with the quality of the components they’ve jammed inside the relatively small chassis. It is a little more expensive than an almost equivalent spec you can piece together on other sites, but it is much more of a bespoke build. It’s been called a ‘zero-fat’ design and is most certainly an impressively lean machine. There is precious little spare room inside the Aurora’s case, but it’s got some creative ways around getting at your components if you want to upgrade later down the line. The swing hinge of the PSU means you can pull that out of the way to get access to the motherboard’s components as well as your GPU. 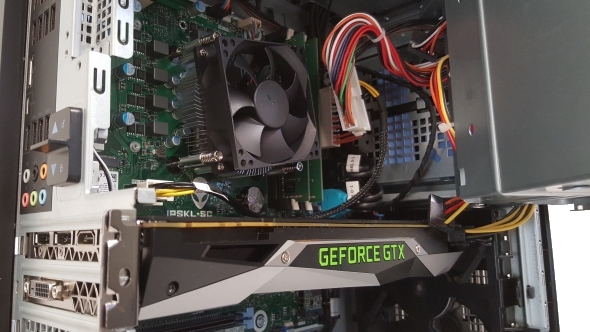 That does mean you’re limited to the basic, low-profile CPU cooler because of the lack of clearance above it and the Alienware board design means you’ll struggle to replace that down the line if you want to upgrade the base system. But other than that you have full access to tweak the rest of your rig’s innards. Performance-wise it’s not far short of much more expensive gaming machines we’ve tested and that storage combo is seriously powerful too, even if you will have to do a little library juggling with the 256GB limit on the speedy SSD. I’ll admit to being a touch disappointed with the Aurora’s aesthetic – it just feels a bit sterile compared to the Alienwares of old – but it certainly displays a lot of style in its component choice and gaming prowess. And that’s what really counts after all.